This year’s Olympic Games in London have been touted as the most connected in history. With an estimated one billion people set to watch the events and millions more expected to log on to keep track of all the action, all aspects of connectivity had to be examined in the lead-up to the event. But the real difference with London 2012 is the mobile aspect. The increase in adoption of smartphones and tablets over the past four years has been enormous, and the number of devices that will be used to access Games coverage has posed a huge challenge for the organisers. There is little they could do about the connections of mobile networks around the world but, when it came to the Olympic venues themselves, mobile operators have been hard at work with the Olympic Delivery Authority (ODA) to make the experience as seamless as possible for visitors. A report published today by the Institute of Engineering and Technology (IET) gave us a behind the scenes glimpse of the planning involved. Planning began back in 2009 when the UK mobile industry met for a BBC workshop to try to establish what the rise in mobile usage, both for normal phone, text and web activities, and media consumption, during the Olympics would be. This included a number of areas, such as mobile web usage, visitor numbers, data traffic, new device types – namely smartphones and tablets – and the need to support those running the Games. Operators even had to consider the queues outside the venues and how much mobile traffic there would be as people waited to enter the park. They concluded the volume of traffic would be 10 times greater than that at similar venues in 2010. There was also the problem of customer expectation, as even by 2009 users expected to have their mobile phone working as they saw fit, with customised apps at a low cost. Also, with the number of events going on simultaneously, people attending one event would also want to check what was going on at other events. The mobile companies considered fighting for 4G spectrum, but Ofcom had already allocated the 800MHz and 2.6GHz bands to broadcasters, which left 3G to take the brunt of the traffic. They decided the best answer was to increase the number of cells at traffic hotspots within the Olympic Park. By careful planning of the cells, ensuring there was no overlap, all the channels of 3G could be reused within each cell site, enabling more people to use the spectrum in that area. Of course, this needed to be tested, so mobile operators chose Twickenham as their experimental ground. Deployment of equipment took place in 2010, so by the time the Six Nations rugby tournament came to the venue in 2011, the operators would be ready to test out their ideas. To boost capacity by 10 times, the operators decided to increase the existing four cells at the stadium to 40. The capacity of Twickenham meant this equated to 2,000 spectators per cell. 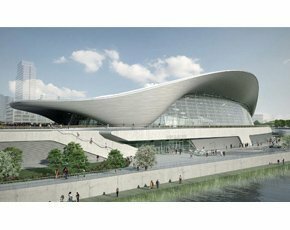 This was much larger than what they expected for the Aquatics Centre at the Olympic Park, which has room for 17,500 spectators, but on this basis they could establish what the number of cells needed on that site would be. Many large deployments of such technology use obstacles, such as buildings – known as clutter – to help define the boundaries of each cell. This is difficult in an open-air stadium, so operators tried instead to use the tiered seating to split the cell areas vertically. Each sector needed to have the signal boosted to be more dominant over interference and outside signals. Rather than having an overall large antenna, antennas needed to be brought closer to the cells to make the signal more concentrated, making the footprint smaller and reducing interference. To preserve the dominance there also needed to be a line of sight between the antenna and the mobile device. As such, the operators decided attaching them to the roof seemed the best adoption to avoid any interference from other spectators, chairs, etc. They discovered, however, that traditional antennas they had hoped to use weakened the definition of the cell boundaries when positioned at this level, which could have a major effect on connectivity. Instead, the operators got to work on using an innovative antenna specially designed for use in stadia, but not previously deployed on such a major scale. These antennas were flat panels, which prevent roll-off and cover wider sectors without bleeding into others. Testing was carried out with these antennas on one-quarter of the stadium during a rugby game in 2011, which previously would have only been covered by one cell. This worked well, but was interfered with by the old system they were still running across the rest of Twickenham. As such, they decided to roll it out fully across the ground, leaving the previous antennas there as back-up. The trial established that, due the odd shaping of many new stadia, with curves, arches, roofs, etc, and the effect of distance on the antennas, only 30 cells were needed, rather than 40, to give the optimum coverage. Once this had been established and deployed, the operators were pleased with the results and were ready to look at transferring this to venues for the Olympic Games. However, although this trial was a success, it was understood that there was no-one-size-fits-all possibility, as each venue varies in size and shape. Also the temporary nature of the infrastructure needed to be considered, because as with the seating, it will be removed after the games. The focus the organisations decided on was the Aquatics Centre. The swimming pool itself caused some difficulty, as there was the opportunity for cells and antennas to interfere with one another due to the lack of clutter, as well as external interference as a lot of cellular infrastructure was being deployed externally. During the planning phase, a 3D model of the centre – both a computerised version and a wire model – was created to help predict what the issues would be. However, this enabled them to take the lessons from Twickenham and test them out, working out exactly where to deploy the new cells and antennas, and optimise the equipment for the best signal possible. With the Olympics in full swing, and swimming one of the major focuses, it will quickly become clear whether all the careful planning has paid off. The key learnings that the mobile operators and the Olympic Delivery Authority took away from the long planning process were to establish what amount of coverage was needed, be aware of the geometry of the building you are trying to deploy antennas and cells in, and to focus on high signal dominance through a joined-up approach with external operators to make sure coverage doesn’t clash. Overall, the importance of a trial and everyone working together to achieve the final outcome was the most valuable of lessons.